Nick Skiles is an as-of-yet unpublished poet, stay-at-home dad to three children, aspiring urban homesteader and curmudgeon-from-birth. Like many millennials, he has a degree from a liberal arts college (in journalism) that he isn't using. Among his chief inspirations are Robert Frost, J.R.R. 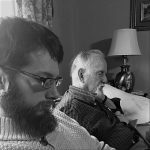 Tolkien, Wendell Berry, and St. Herman of Alaska. He lives, prays, reads, writes, gardens, composts, drinks his best friend's homebrew and smokes pipes on porches in Canton, Ohio.